Court 72 in the Royal Courts of Justice – where earlier this week three Court of Appeal judges spent two days hearing Unison’s appeal against the High Court’s dismissal of its two applications for judicial review of ET fees – is one of the more modern courtrooms to be found in the laughably camp, Gothic Revival edifice that sits on the Strand. 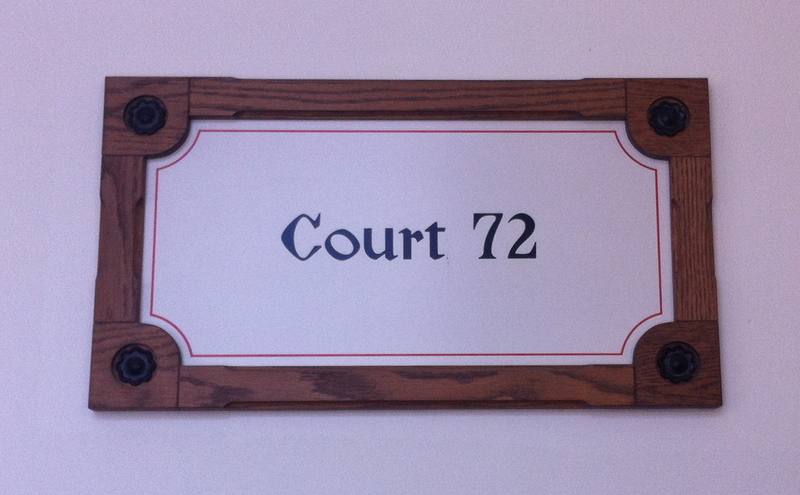 Not quite a 21st century courtroom, perhaps, but certainly more 1960s than 1860s. And, to this lay observer, the appeal judges’ scrutiny of the appellant and respondent’s by now well-rehearsed arguments was a tad more modern than that offered by the reputedly clever but oh-so-out-of-touch-with-2015-reality Elias LJ in the High Court last October. On Tuesday, when Karon Monaghan QC of Matrix Chambers presented Unison’s five grounds of appeal, all three judges had asked challenging questions that, to my mind, indicated a genuine desire to understand the real nature and impact of the fees regime. But things got a little more interesting on Wednesday, when David Barr QC of Temple Garden Chambers rose to present his defence of The Devil [Shurely ‘the Lord Chancellor’? Ed]. I think it’s fair to say that Mr Barr is not one of the Bar’s most flamboyant QCs, but it often sounded to me as if even he wasn’t convinced by the arguments that he frequently struggled to locate in the voluminous bundle. In the High Court, Susan Chan had at least sounded as if she believed the garbage spewing from her mouth. The three judges – Moore-Bick LJ, Davis LJ and Underhill LJ – certainly didn’t look terribly impressed, and the tone of their questioning became ever more mocking and disbelieving. Indeed, if these things were decided on the body language and facial expressions of the judges, then I’d say Unison have their appeal in the bag. During a lengthy and turgid section on the Public Sector Equality Duty, Mr Barr seemed to be trying to bore the judges into submission, prompting Underhill LJ to swivel maniacally in his chair with the look of someone who’s just got a whiff of the dog poo on their shoe. But it was Mr Barr’s attempted defence of the appeal ground of ‘effectiveness’ that elicited the most mocking responses from the bench. The problem was that there were increasing numbers of [ET] claims and the existing model was unsustainable. As previously explained on this blog, this is claptrap and bunkum. 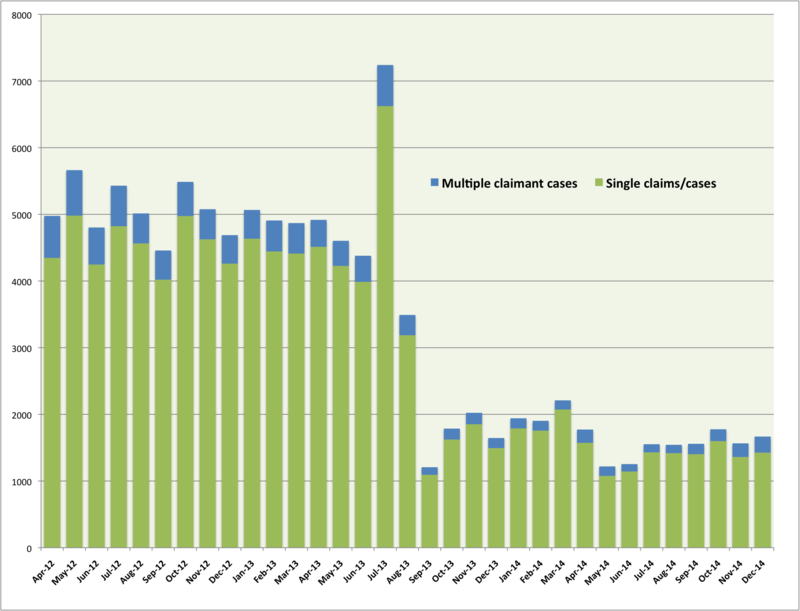 Leaving aside the (admittedly many) claimants in a relatively small number of multiple claimant cases – as both Ms Chan and Mr Barr asserted we (and the judges) should do when analysing the massive drop in claims since July 2013 – the number of claims/cases was in fact falling towards a record low by 2011, long before the fees came into force. But it’s also at variance with the publicly stated objectives for the fees regime of ministers, as confirmed by the recent announcement of the long-promised review. to improve the efficiency and effectiveness of the tribunal. Nothing about dealing with an “unsustainable” increase in claim numbers there. Indeed, the second and third objectives are just flannel, as would-be ET claimants need no encouragement from fees to use the mandatory early conciliation services of Acas, and there is simply no way fees could by themselves “improve the efficiency and effectiveness” of the tribunal system – other than by deterring two-thirds of the annual caseload (which, as already noted above, Mr Barr assured the judges was not the aim of the fees). As for transferring some of the cost to the taxpayer, in 2014-15 the Ministry’s net income from fees (after allowing for remission and administration costs) was a mere £4.3 million. However, the evidently confused Mr Barr isn’t the first to let the cat out of the bag. For it was none less than the then Lord Chancellor, Chris Grayling – reputedly not the sharpest pencil in the box either – who revealed to the Yorkshire Post in November last year that, by introducing fees, the Coalition government was “trying to deal with a situation where it was too easy to go to a tribunal and where employers, often good employers, were easy prey for questionable claims”. In short, despite Mr Barr’s polished assurance to the contrary, the aim was to deter claimants. In the High Court, Moses LJ, Elias LJ, Irwin J and Foskett J all failed to see this, even as unrepentant Tory ministers such as Matt Hancock were claiming ‘success’ for the fees on this very basis. And, indisputably, the officially unstated aim has been achieved, with knobs on. But as to whether any of this means the fantabulous Unison legal team will be downing celebratory drinks a month or two from now, I have learnt to my cost to reserve judgment. So, the Ministry of Injustice has finally decided to launch its long-promised review of the employment tribunal fees introduced in July 2013. This is the review, you might remember, that the Ministry was busy “finalising” the timing and scope of as long ago as June 2014. And it’s no doubt entirely coincidental that, next week, the Court of Appeal will hear Unison’s appeal against the High Court’s dismissal of their application for judicial review of the fees regime. The wording of today’s announcement provides little cause to think that work-starved employment lawyers should hold their breath until the outcome of the review. To my jaundiced eye, the stated terms of reference suggest the Ministry will be scouring all kinds of tribunal and economic data for any factor – other than the fees, obviously – that might possibly have contributed, even just a tiny bit, to the sharp decline in ET case numbers since July 2013. So the Ministry’s finest minds will be studying the “historic downward trend” in the number of ET claims – you’ll no doubt remember how much Vince Cable and other ministers made of that trend in late 2011 and 2012 – as well as the impact from “the improvement in the economy” and “changes to employment law”. I’ll come back to those factors in a minute, but today also saw the scheduled publication of the latest set of quarterly ET statistics. These new figures remind us just how big the fall in case numbers has been since July 2013. And, perhaps more interestingly, especially to the crack employment team at top 100 law firm Hugh James, they suggest that exploited and mistreated workers, having ‘acclimatised’ to the fees in Q3 of 2014-15, somehow de-acclimatised in Q4. I’m looking forward to reading about this in the Law Society Gazette, but meanwhile here’s a chart. But back to those legal and economic factors (other than the introduction of hefty, upfront fees in July 2013) that – three, six or maybe 24 months from now – the Ministry will no doubt inform us wholly explain the fall in ET case numbers since July 2013. As is evident from the above chart, and as reported ad nauseam on this blog, there was a modest downward trend in ET case numbers in the quarters immediately prior to the introduction of fees, quite possibly linked to the steady improvement in the economy in recent years. From Q2 of 2012/13 to Q1 of 2013/14 – the last full quarter before fees – the number of new single claims/cases declined by 5%, from 13,407 to 12,727. I imagine the Ministry boffins will find no reason to assume that that modest downward trend would not have continued, had fees not been introduced in July 2013. Indeed, they may well find reasons to argue that it would have accelerated. So, let’s assume that, over the next three quarters, single claims/cases declined by 6%. In that scenario, the number of such claims/cases would have fallen to 11,963 by Q4 of 2013/14, the last full quarter before the implementation of Acas early conciliation (from 6 April 2014). And – if that 6% rate of decline continued – by Q4 of 2014/15, the quarter for which the figures were published today, single claims/cases would have fallen to 11,010. Which, it’s worth noting, would have been a record low, unseen since the passing of the first Corn Laws in 1815. Now, that implementation of Acas early conciliation (which became mandatory in May 2014) may well be what the Ministry had in mind when referring, in the review’s terms of reference, to the impact on ET case numbers of “changes in employment law”. Because the primary aim of Acas early conciliation was to reduce the number of claims/cases by a whopping 17% (that being the figure given in the final BIS impact assessment). So, from Q1 of 2014/15 onwards, we need to reduce the number of single claims/cases in my ‘no fees’, downward trend projection by 17%. And, if we do that, we get the following chart, in which the green columns represent the number of single claims/cases we might have expected to see in each quarter, had fees not been introduced, and the red columns represent the actual number of such claims/cases. 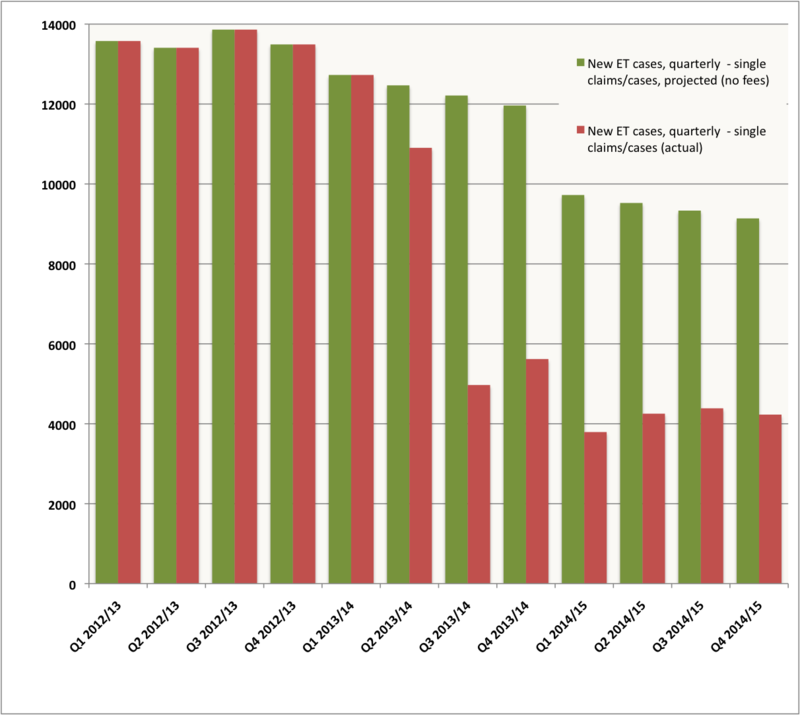 We can total up the differences between the red and green columns, and that gives a figure of 36,210 single claims/cases ‘lost’ to ET fees between 29 July 2013 and 31 March 2015, after allowing for the ‘historic downward trend’ in case numbers and the introduction of Acas early conciliation. And that figure continues to increase by some 5,000 every quarter (so is, at the time of writing, in excess of 40,000). 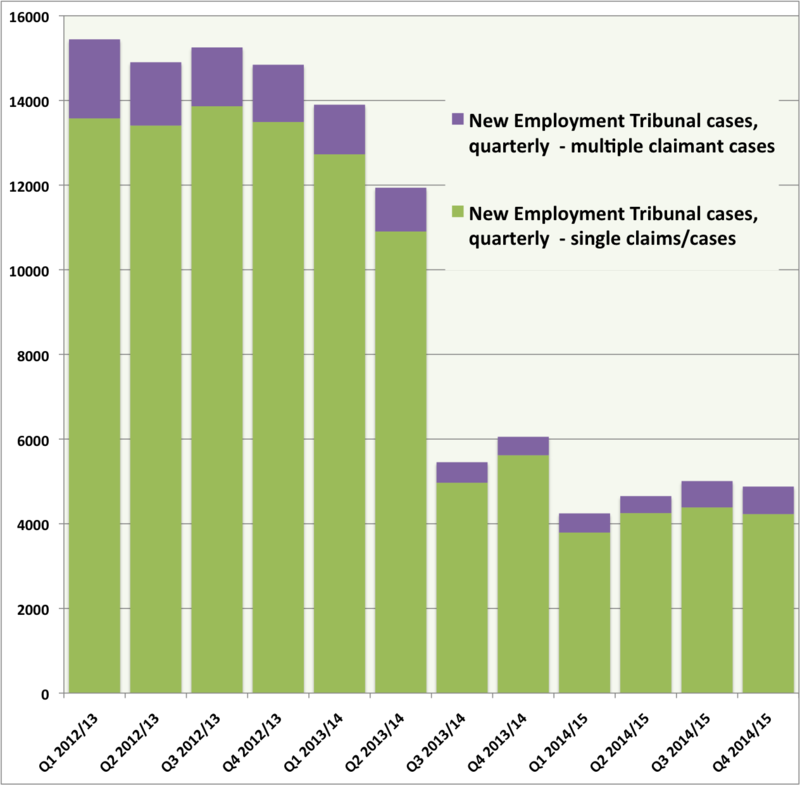 Now, I can’t think of any other significant (and relevant) change in employment law since July 2013, and I have difficulty imagining what “changes in users’ behaviour” might explain more than a tiny bit of the difference in the height of the green and red columns in recent quarters (there is no evidence to suggest that displacement of single claims/cases to the County Courts has been more than negligible). So I think I’ve just about done the Ministry’s job for it. For nothing. In an afternoon. But perhaps the Ministry’s boffins will find some X Factor I have stupidly overlooked. the hefty, upfront tribunal fees introduced by the Ministry of Injustice in July 2013 have eradicated exactly the kind of tribunal claim that [former business secretary] Vince Cable [and former BIS employment relations ministers] Ed Davey and Norman Lamb evidently had in mind when they came up with the section 16 penalty regime: a relatively low value claim (because the claimant is or was low paid) against a deliberately exploitative employer. For why would a vulnerable, low-paid worker subjected to ‘wage theft’ of a few hundred pounds gamble up to £390 on trying to extract the unpaid wages or holiday pay from their rogue (former) employer? Well, five months have passed, and BIS has been asked the same question, this time by Caroline Lucas MP. BIS doesn’t seem to have an employment relations minister as such any more, but skills minister Nick Boles has now replied, confirming that the number of section 16 penalties imposed to date is … just three. Of which two remain unpaid. As when I wrote on this issue in January, it is theoretically possible that this is simply a good news story: the threat of a financial penalty has incentivised employers to avoid breaching their workers’ rights in a way that has “aggravating features”. But it seems much more likely that my original theory holds true. That, thanks to fees, employment judges are no longer seeing many of the kind of ‘rogue employer case’ at which the section 16 provisions were aimed. This was a claim my client thought ‘misconceived’. Perhaps the type of unmeritorious claim the [then] government was trying to weed out with the introduction of tribunal fees. However, the claimant was a high earner and could easily afford £1,200 in the hope he would make a return on this investment. It seems those employees with entirely valid claims, with little means to pursue them, may not be so lucky. Nic concludes that “the fees regime introduced [in July 2013] really isn’t hitting the mark and preventing claims with little merit entering the system. There’s also a significant risk that those with genuine claims are being prevented access to justice because they can’t pay their way”. And, last month, top employment barrister (and founder of this blog) Sean Jones QC suggested to the CBI and others that “perversely, it is fast track, high merit, low value claims that fees have seen off”. If we are right, this would explain why – contrary to what we could expect if fees were simply deterring ‘vexatious’ and unmeritorious claims – the overall success rate of ET claims has fallen significantly since July 2013. In short, like the protagonist in Depeche Mode’s classic “Wrong” – who answered “the wrong questions with the wrong replies” – Coalition ministers appear to have “reached the wrong ends, by the wrong means, with the wrong method and the wrong technique”. However, if the current ET fees regime was, indeed, the “wrong plan, in the wrong hands”, then at least the new crop of ministers has an opportunity to make amends. The government’s recent reply to another parliamentary question by Caroline Lucas suggests ministers are still committed to carrying out the long-promised review. All we need now is a date. Are ET claims going up? Yes but no but yes but no but … whatever! On Monday afternoon, I was happily wandering through a series of dimly-lit rooms, admiring some rather fine naked bodies in all manner of unlikely poses, when a series of tweets by #ukemplaw tweeps alerted me first to one, then to another, and then to a third news report, each announcing new hope for Britain’s work-starved employment lawyers. 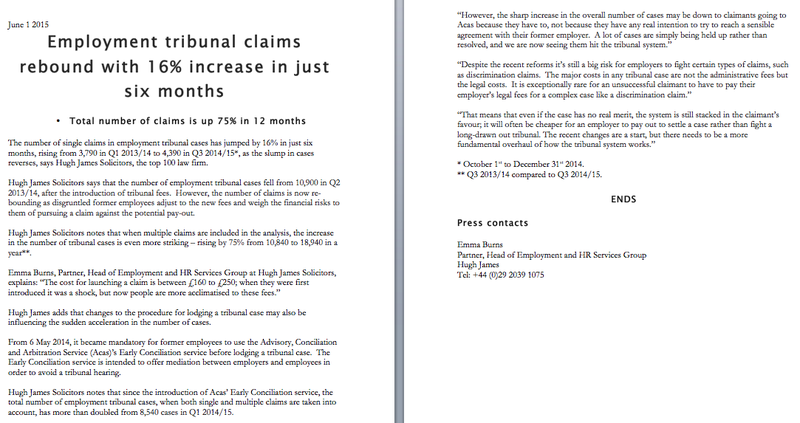 “Employment tribunal claims up 75 per cent in 12 months”, screamed The HR Director, which claims to be “the most respected independent resource for HR directors and senior HR practitioners in print, in person and online”. “Employment tribunal caseload rebounds after slump”, bellowed the Law Society Gazette, which claims to be the “publication of record to solicitors in England and Wales since 1903”. Hallelujah! Crack open the champagne! Come back Chris Grayling, all is forgiven. Let the gravy train roll! And then – cynic that I am – the doubts began to set in. Surely the latest set of ET statistics isn’t out until next week, I mused, while sneaking a closer peek at a chiseled pair of buttocks. So, pausing only to check out some extremely pornographic vases, I read beyond the dramatic headline of each news report. Yes – and I’m truly sorry to have to break this to you, employment lawyers – we’ve been here before. It’s the old ‘Get Our Law Firm’s Name in The Papers in The Hope of Drumming-up Some Much-needed Business by Issuing a Press Release With an Eye-catching But Rubbish Story About ET Claim Numbers’ trick. Last year, it worked rather well for GQ Employment Law, who were rewarded by the legal editor of the Times, Frances Gibb, with a very silly story about how discrimination claims were bucking the steeply downward trend under fees. And in 2013 it worked extremely well for law firm EMW, for whom publicists Mattison PR [sic] secured splashes in both the Times and Telegraph, later picked up by HR Magazine and the CIPD. (Incidentally, Nick Mattison of Mattison PR wasn’t very pleased when I wrote about EMW – he rang one of my then senior managers to complain about me). So, just how stale and silly is the story sold to The HR Director, CityAM, the Law Society Gazette, The Herald in Scotland, and Solicitors Journal by Hugh James Solicitors (or Mattison PR)? Have mistreated and exploited workers become “more acclimatised” to ET fees? Well, the official statistics that The Law Society Gazette reports as being “obtained” by Hugh James Solicitors were, of course, published by the Ministry of Justice on 12 March. And you really don’t have to have spent nearly three months studying those statistics to ‘observe’ that the number of single claims/cases did indeed increase by 16% from 3,792 in Q1 of 2014/15 (erroneously referred to as Q1 of 2013/14 in the Hugh James press release – an error dutifully copied out by both The HR Director and Law Society Gazette), to 4,386 in Q3 (October to December 2014). Or to ‘observe’ that the number of multiple claims increased from 4,478 to 18,943. But can we conclude from this that would-be ET claimants have become “more acclimatised” to ET fees? Indeed, can we conclude anything at all from these figures? Well, the short answer to both questions is: no. And the slightly longer answer is: only if you are an idiot (or a journalist at The HR Director, the Law Society Gazette, CityAM, The Herald in Scotland, or Solicitors Journal with a law firm’s press release to copy out before your deadline). Because you only have to spend less than three minutes looking at Table 1.2 of the Ministry’s statistics – freely available even to Law Society Gazette and The Herald journalists since 12 March, remember – to see one obvious explanation for at least a large part of this counter-intuitive rise in the number of ET claims, from Q1 to Q3 of 2014/15. We can see, for example, that equal pay claims actually fell, from 1,995 to 1,759, as did redundancy claims, from 900 to 675. Meanwhile breach of contract claims rose by a less than whopping 4.3%, from 1,928 to just 2,012. But Working Directive claims rose by 488%, from 2,171 to 10,604, and Unauthorised Deductions claims rose by 420%, from 2,545 to 10,701. And, frankly, you don’t have to be a former Pulitzer Prize winner to realise what was going on here. In short, a high-profile (and certainly well-reported) legal ruling on holiday pay in early November led to a (relatively small) tsunami of holiday pay claims in the final weeks of 2014, as workers (and their unions and lawyers) rushed to take advantage of the ruling. Do a few basic sums to take those extra holiday pay-related claims out of the picture, and the total number of jurisdictional claims increased from about 27,100, to about 38,800. Yes, that is still a rise of some 43%, from Q1 to Q3. But you also don’t have to be a legal genius to know that the figures for Q1 were artificially (and quite considerably) depressed by the implementation, at the start of that quarter, of Acas early conciliation, which introduced a one-month delay in the registration of new ET claims (known to employment lawyers everywhere – other than those at Hugh James Solicitors, it would seem – as the ‘Acas pause’). This ‘Acas pause’ is plainly evident in the columns for May and June 2014 in the following chart, which – unless you are Emma Burns or Catherine Sirikanda – you have probably seen at least one version of before. So an increase in the quarters immediately following Q1 of 2014/15 was inevitable, and by itself tells us nothing whatsoever about the relative inclination of mistreated workers to issue an ET claim. It is (much) more meaningful to compare Q3 of 2014/15 to Q4 of 2013/14 (i.e. the three months immediately prior to the introduction of Acas early conciliation). And when we do that, we can see that the figure for single claims hailed as a 16% increase by Hugh James Solicitors – 4,386 – was still well below the 5,619 just nine months earlier, and the 4,969 in the quarter before that. I don’t see much ‘acclimatisation to fees’ in those figures, or indeed in the above chart. So, well done Emma Burns of Hugh James Solicitors, you got your firm’s name in the papers. But it’s a moot point whether you have acted in a way that is consistent with ensuring public trust in the legal profession. And you certainly haven’t enhanced your personal entry for Employment Law Genius of the Year.